The Unpredictability of Gameplay explores the many forms of unpredictability in games and proposes a comprehensive theoretical framework for understanding and categorizing non-deterministic game mechanics. 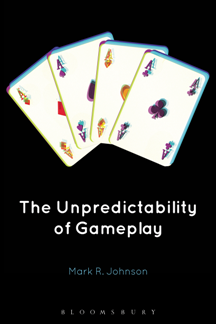 Rather than viewing all game mechanics with unpredictable outcomes as a single concept, Mark R. Johnson develops a three-part typology for such mechanics, distinguishing between randomness, chance, and luck in gameplay, assessing games that range from grand strategy and MMORPGs to slot machines and card games. He also explores forms of unanticipated unpredictability, where elements of games fail to function as intended and create new forms of gameplay in the process. Covering a range of game concepts using these frameworks, The Unpredictability of Gameplay then explores three illustrative case studies: 1) procedural generation, 2) replay value and grinding, and 3) player-made practices designed to reduce the level of luck in non-deterministic games. Throughout, Johnson demonstrates the importance of looking more deeply at unpredictability in games and game design and the various ways in which unpredictability manifests while offering an invaluable tool for game scholars and game designers seeking to integrate unpredictability into their work.